Change is inevitable. It naturally occurs in life wherever you are, whatever you do, whatever your status in life is, whether you are an employee or a businessman. Nevertheless, it depends upon the person how he deals with each change that comes in his way. 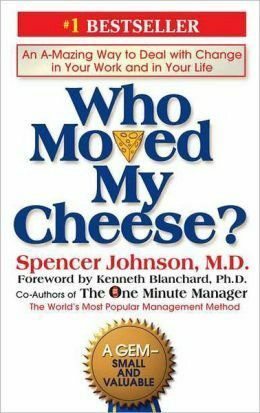 In the world, there are four types of people and that is deliberately addressed in the book entitled, Who Moved My Cheese? : An Amazing Way to Deal with Change in Your Work and in Your Life written by Dr. Spencer Johnson. 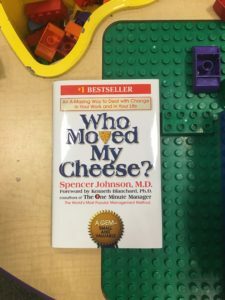 It is a phenomenal book with each page containing valuable and meaningful insights for entrepreneurs and employees alike with one simple goal: to find “Cheese”. The first scene encompasses the story of former classmates gathering around during a high school reunion to talk about their situations in life. Until one of their classmates, Michael, told them about the tale “Who Moved My Cheese?” which is actually the core story of the book. HAW: another little person like Hem who knows how to laugh at his mistakes and adapt to the change when he sees that it will lead into something better. The “Cheese”, on the other hand, is a representation of the opportunities or whatever we want to have in our life, such as a successful job, business, relationship, health, money, freedom, achievements, and material things, among others. The tale focuses on the four characters, Sniff, Scurry, Hem and Haw, who were on a journey in the maze to find the cheese. Hem and Haw had finally found their stock of cheese in Cheese Station C where they found comfort and ease. They even lived near it and invited friends to the station to boast their triumph. Little did they know that their pile of cheese was being gradually reduced until one day, they got the shock of their lives when they went to Cheese Station C and found nothing. Meanwhile, following their instincts, Sniff and Scurry never ceased to search for “New Cheese”. Whenever they found a supply of cheese, they monitor it every day to determine shortage. Back to Hem and Haw, grief and denial followed after the incident. They couldn’t believe that their stock of cheese was gone. They keep on digging the walls of Cheese Station C as they believed that the cheese might just be there somewhere. That was what they did day after day until they became irritable. Haw finally realized the futility of what they’re doing. He learned to laugh at himself and told Hem that maybe it’s time that they search for a new cheese. However, Hem was skeptical and refused to get out of the station and told Haw that he can’t take his chances on the maze anymore and that he is already too old for that. Haw then ventured out to the maze to look for a new cheese and found that he was happier than he thought he would be – better than the way things were when he was still in Cheese Station C. He was inspired by Sniff and Scurry’s mindset. Along the way, they realized so many things, positive ones, and wrote them on the wall. He found several pieces of chees on the maze and tried to give some to Hem when he came back, but Hem still declined to come with him. Determined, Haw continued his quest until he finally found Cheese Station N where he found quite a large stock of different kinds of Cheese. He also found Sniff and Scurry at the station. This time, he already knew what to do. He monitored the pile of cheese every single day, recalled the things he learned in life, and reminded himself to always move with the “cheese”. Suddenly, a movement outside the Cheese Station N grew louder and louder. Haw could only hope that it was his friend Hem who realized that he should get out of his comfort zone, face his fears and follow the traces he left on the wall to also move with the cheese. Take control of your life rather than the other way around. Be patient. People usually start from little things to get ready when there’s a bigger opportunity coming. Embracing change is not dependent on age. No matter how old you are, it is never too late for a change. Instead, open your mind and look on the positive side of things. Face the challenges. Never fear them as they will take you to success. While taking several steps, you will find that the fear reduces and along the way, do not be discouraged to continue. Always monitor your current situation. Always ask yourself: “Did some things change?” Be more alert and always anticipate change. It’s better late to seize opportunities than never doing so. When you are fearful, always think that “when you move beyond your fear, you feel free”. Do not scare yourself as it would just make things worse. Reflect and plan the steps that you should do in your life. Always enjoy what you do, no matter how difficult it is. Picture how you would like to see yourself realistically. The more you imagine, the more it becomes real and believable. Think of what you gain instead of what you lose. A change would not lead to something worse, it could lead to something better. Some people are afraid of something new, they still prefer their usual and traditional routine which makes it difficult for them to embrace change which continually and naturally occurs. Taking a new direction will help you generate strength and vigor and you’ll find out that the goal is only part of the challenge. What you are afraid of is not as bad as you thought it is, the fear you build inside is worse than the existing situation. Do not deny the situation that has already taken place. Helping other people is useless when they let fear and inflexibility consume them. Some people are very adamant and refuses to accept the changes. Following the series of events in the story only proves that the saying, “Try and try until you succeed” as a matter-of-fact, is true after all! With Who Moved My Cheese? Dr. Spencer Johnson realizes the need for finding the language and tools to deal with change–an issue that makes all of us nervous and uncomfortable. Most people are fearful of change because they don’t believe they have any control over how or when it happens to them. Since change happens either to the individual or by the individual, Spencer Johnson shows us that what matters most is the attitude we have about change. When the Y2K panic gripped the corporate realm before the new millenium, most work environments finally recognized the urgent need to get their computers and other business systems up to speed and able to deal with unprecedented change. And businesses realized that this was not enough: they needed to help people get ready, too. Spencer Johnson has created his new book to do just that. The coauthor of the multimillion bestseller The One Minute Manager has written a deceptively simple story with a dramatically important message that can radically alter the way we cope with change. Who Moved My Cheese? allows for common themes to become topics for discussion and individual interpretation. The story may be likened to a children’s tale, but digging deeply, it contains important lessons one should reflect and inculcate in his or her mind. It may not be easy to get out of your comfort zone, but we must learn to adapt to change and be flexible considering that nothing is permanent in this world. Yola Angeline is a graduate of a Bachelor’s Degree in Nursing and currently an international freelancer and blogger.